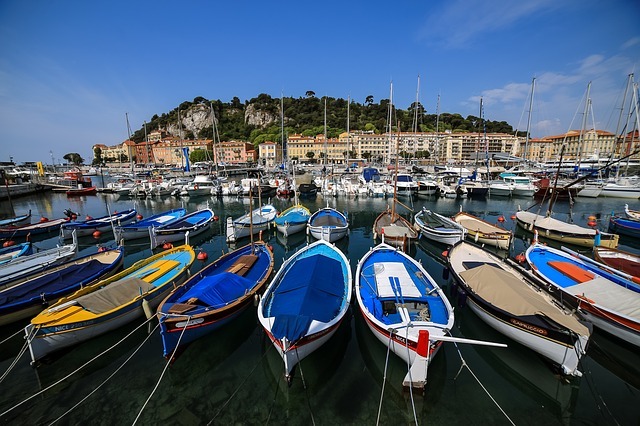 Pronounced like the word “niece”, Nice is a large and popular travel destination on the east coast of the French Riviera close to Monaco and Italy. Because there isn’t much by way of camping facilities in Nice itself, your best bet is to pitch your Nice motorhome rental or campervan hire in campsites along Côte d’Azur and travel into the city for day trips. Some campgrounds for your campervan rental in Nice are even located a few minutes away from famous beaches. There are plenty of RV operators like Avis Car-Away Motorhome Rental, and Big Sky Motorhome Rentals. Book them for an unforgettable Niçoise holiday. The port city Nice is a favorite with tourists for a reason; the popular waterfront, the Promenade des Anglais, the beautiful beaches and museums all attract visitors of every stripe. Be aware that the beaches in Nice are covered in gallets – pebbles or large flat stones instead of white beach sand, so come prepared with sandals and a cushion to sit on. The water is cool, crystal clear and very blue, but should be avoided by less experienced swimmers. For families, hop in your Nice campervan hire and visit nearby Villefranche-sur-Mer, Antibes and Cannes instead, all less than 40 minutes away on either side of Nice and outfitted with campsites. Hiking-wise, your motorhome hire in Nice lets you access stunning trails; that begin in La Turbie near Monaco and the Grande Corniche. These also require more experienced hikers, but you’ll be rewarded with breathtaking views over the entire Riviera. Eze is a small medieval town perched on a rocky peak like an eagle’s nest and overlooks the French Riviera and the Mediterranean. Take a short trip here for the day on your Nice motorhome rental and enjoy the popular cactus garden there. The path that goes down the mountain from town into Eze Sur Mere is called “Nietzsche’s Path”; named after the German philosopher. This is a charming 40 minute walk with a gorgeous hidden waterfall. For an olfactory adventure, follow the scent of the Fragonard perfume factory in Grasse, an hour southwest of Eze, which is free to enter. Also indulge your appetite in local specialties. These include a kind of chick-pea bread called Socca and the famous Salade Nicoise made with tuna. Fish is a menu staple so you can also try Soupe de Poisson or Pan Bagnat, a kind of tuna sandwich. Pick one of these classics before returning to base camp in your camper rental in Nice to continue the rest of your French excursion. Nice is Côte d’Azur’s major beach resort. However the highbrows and the jet set hang around the turquoise waters and white sand beaches of St. Tropez; located about an hour and a half by RV rental or campervan hire in Nice. Luckily, you will find pitches right here and even right on the beach if you come in early April through early October. Cannes is sandwiched between the two popular resorts; and gets its own buzz just before, during and after the film festival usually scheduled around May. The historic port of Marseille, France’s oldest city, lies a little more than a couple of hours west. An hour farther out of Marseille was Van Gogh’s haunt, Arles. If you take the cue of the Rhone River from Arles you will invariably end up in Lyon three hours inland, and another three hours east to the base of the Alps. If you’d rather high-roll in the craps table than don skis; drive your Nice motorhome rental in the opposite direction to Monaco, half an hour east of Nice. From here, the Ligurian coast, Italy’s original Riviera, is only three hours away.